Are you working on a curriculum vitae? Not sure how to write it, or what information to include? If you are on an academic, scientific research, or medical career track in the United States, chances are good that you’ll be asked to provide a curriculum vitae rather than a typical resume. 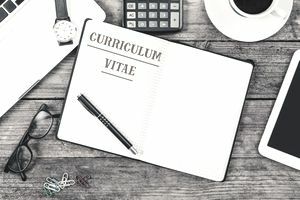 In Latin, the phrase “curriculum vitae” means “course of life.” Which is quite apropos if, as an entry-level candidate, you feel like you’ve spent your entire life in graduate school or medical school! In modern English, the concept behind the curriculum vitae might better be translated as “the course of one’s professional education and career.” In short, institutions that request these documents are most interested in one’s well-rounded credentials for the job (as expressed through training and subsequent career experience). This differs from standard resumes, which focus more on competencies. Here's information on why, when, and how to use a CV, when to use a resume vs. a curriculum vitae, CV writing and formatting guidelines, the differences between U.S. and international CVs, and examples. When should job seekers use a curriculum vitae, commonly referred to as a “CV,” rather than a resume? In the United States, a curriculum vitae is used primarily when applying for academic, education, scientific, medical, or research positions. It is also applicable when applying for fellowships or grants. Here’s more information about when to use a curriculum vitae instead of a resume. When seeking a job in Europe, the Middle East, Africa, or Asia, expect to submit a CV rather than a resume. Keep in mind that overseas employers often expect to read the type of personal information on a curriculum vitae that would never be included on an American resume, such as date of birth, nationality, marital status, and place of birth. United States law governing what information job applicants can be asked to provide does not apply outside the country. There are several differences between a curriculum vitae and a resume. A curriculum vitae is a longer (two or more pages), more detailed synopsis of your background and skills. As with a resume, you may need different versions of a CV for different types of positions. Like a resume, a curriculum vitae should include your name, contact information, education, skills, and experience. In addition to these basics, however, a CV also includes research and teaching experience, publications, presentations, grants and fellowships, professional associations and licenses, awards and honors, and other information relevant to the position you are applying for. Start by making a list of all your background information, then organize it into categories. Make sure you include dates on all the publications you list. Some countries outside the United States expect you to include your date of birth on your CV. If you are applying to a foreign job, research the particular country’s protocol for job applications. If you are using a curriculum vitae (CV) or resume to apply for a job in the United States, due to current laws regarding age discrimination, you cannot be required to include your date of birth on your curriculum vitae. Once you have made a list of the information you want to include, it's a good idea to create a custom curriculum vitae that specifically highlights the experience you have that is relevant to the job you are applying for. It takes more time to write a custom CV, but it's worth the effort – especially when you are applying for jobs that are a good match for your skills and experience. Use accomplishment-oriented bullets that start with an action verb and include a result. Start with a Professional Profile (also called a Summary) that highlights the best of what you as a candidate are offering. Edit content to include those areas of expertise, skills, and knowledge that specifically match the job requirements; not all the details of your education and employment history (work, research, fellowships, etc.) may be relevant. Carefully rank and organize the sections of your resume according to what the institution you are applying for is seeking. For example, if you are applying to a university where research is emphasized, you should begin your list of publications on page one, right after your initial professional profile. If, on the other hand, you know that teaching is valued over publication by the department, you’ll want to give your professional career history pride of place on the first page. This is an example of a curriculum vitae. Download the curriculum vitae template (compatible with Google Docs and Word Online) or see below for more examples. Dedicated and patient-focused M.D. positioned to excel within residency providing opportunity to grow in knowledge and therapeutic practice of pediatric medicine. Provided leadership, companionship, and emotional support to undergraduate residents of university dormitory. Helped to support the needs of underserved families at free medical clinic. Provided companionship to critically ill children in animal-assisted therapy program. CrossFit, surfing, photography, and oboe performance. These sample CVs form a helpful guide of what to include in your CV, tips for writing it, and how to format it. What's the Difference Between a Resume and a Curriculum Vitae?